Refined comfort food for the heartiest of appetites in a charming setting. Breakfast & Lunch Tues.-Thurs., Dinner nightly, Brunch Fri.-Mon. 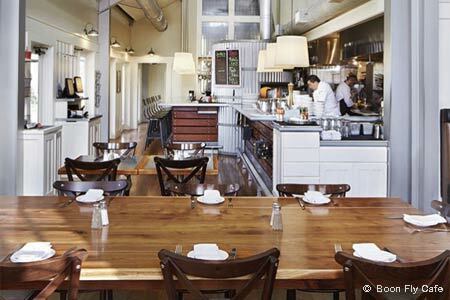 : Veer off the highway to the jolly red barn that embodies Carneros Resort and Spa’s “rustic moderne” design. Traces of the farm include a silo-like pizza oven sheathed in galvanized steel and a casual, kitchen-fronting wood-post bar. It’s all balanced by refinements such as banquette seating and nostalgic black-and-white photos. Chef Albert Rivera teases out the comfort food theme with a hearty brunch menu starting with the Zesty Bacon Bloody Mary, topped with applewood bacon and a celery salt rim --- a meal unto itself. The Benedict with jalapeño hollandaise or the triple-stacked griddle cakes with banana and chocolate chips are decadent ways to start any day. Midday meals offer flatbread with smoked salmon and crème fraîche or a juicy Kobe beef burger with all the fixings, including a farm-fresh egg. The warm arugula salad appears as lighter fare, but the added goat cheese, mustard pancetta vinaigrette and poached egg stays consistent with comfort. For dinner, choose one of the nightly specials such as beer-battered fish ‘n’ chips or the popular chicken and waffles with maple syrup. A trim, Napa-dominant wine list rounds out the robust menu.